Monday 18th Match 2019 – it’s been a while…. I’ve not gone MIA, finally life has been getting in the way of cancer! For too long cancer and its treatments have been preventing me from living the life I wish to, I can happily say that around Christmas time there was finally a switchover – which is why it’s taken me so very long to do any updates lengthier than a Facebook or Instagram status (I am @thelastmealbeforechemo on both). I’ll try and do a quick catch up; you may recall that Ally, Filly and I decided to move house and we were expecting to move in August last year, the week after I finished Radiotherapy to be precise. Sadly the move fell through and we thought we had lost our dream home, after everything that had happened in the previous 9 months we were really down and we struggled to see the positives for a short time. I am so so happy to report now though that we have finally moved, and into our dream home. We’ve been on our 24 acre farm in the middle of Exmoor for just over 4 weeks, we moved the day before my birthday, which was the best gift I could’ve wished for (well within the realms of the possible, I don’t think I was going to get a cure for cancer for my birthday no matter how hard I wished.) Its fair to say that the weather has been mixed, we’ve been on the beach building sandcastles without needing our coats on, but we’ve also had gales that have blown down stables and snow. As I write I have a house full of contractors – decorator, scaffolders, electricians, landscape gardeners and heating engineers, we’ve also had carpet fitters, satellite internet chaps (we are so remote that we need our internet via satellite) and builders; thankfully they have all been lovely and have been very gracious about the slightly rubbish cakes that Filly and I have been baking for them. Despite the extensive renovations that are needed to the house, we feel settled already and have been made to feel very welcome by our neighbours (we only have 2 neighbours within 2 miles of the house in either direction) and the locals. In terms of treatment, I have decided not to transfer my care to another hospital, although it is a drag to get ourselves over to Gloucestershire for each of my medical appointments I just don’t feel strong enough to ‘get to know’ a new hospital and a new oncology team; I have a feeling of reassurance at cheltenham hospital and when I walk in I always know someone and I don’t want to have to start all over again, its too close to the feelings I had at the beginning of treatment. The Wednesday of our house move week (we moved on the Friday) I had my first Zoladex implant injection; this is a new medication to block my ovaries from producing Oestrogen, my cancer was highly Oestrogen positive which basically means that my cancer used Oestrogen to grow, so by blocking (Tamoxifen) and stopping the production of it there is a hope that it lessens the risk of recurrence. It is not a pleasant experience as the needle is vast, but I will have to repeat it every 28 days for the next 5-10 years. Exactly a week after we moved we made the slog up the motorway to Cheltenham hospital for my final Hercpetin injection. I have to admit to feeling fairly sick, and thats not just down to Ally’s driving (why do pilots have to drive like they fly?!) I have always hated the Herceptin jab, they last for 5 minutes into alternating thighs and once the needle is in one can always feel the nurse wriggling the needle around, it always makes my stomach turn. I’ve said at the end of each part of treatment that I have a minor breakdown and the end of Herceptin was no different, it feels so scary to think that those rogue cells could just start dividing again at any point with relatively little to stop them. It occurred to me this week that the ‘cancerversaries’ are coming thick and fast and the reminders are just everywhere. 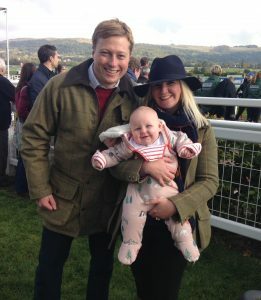 Ally and I have been to watch the Cheltenham Gold Cup almost every year since we met, last year we watched it from my chemo-chair while I was hooked up to the drugs and the scalp cooling machine; it wasn’t all bad though because we were able to have a little gamble! This year we couldn’t attend the Gold Cup again, but we watched it in our wonderful new home, although it was rather a grainy picture as we haven’t got a proper TV aerial yet so we have a temporary old-school one stuck to our sitting room window. We watched it at home because Ally and I were having another ‘grown up’ weekend away; Ally had a ‘work do’ on Friday and on Saturday we were off to Twickenham to see England vs Scotland in the Six Nations. Ally’s work function was a black tie affair, as soon as he told me that my heart sank as I worried I’d have noting to wear (and all of our money is being spent on house renovations) but I managed to cobble something together without having to buy anything new or starve myself for a month. The Navy and the vast majority of Ally’s colleagues have been brilliant throughout my treatment, but being in ‘his world’ for a night made me realise how lonely and helpless he must’ve felt when he had to leave me to return to work knowing how sick the treatment was making me and not knowing what the future held, how long he would have a wife for, or whether he would have to be a single father to Filly. To have been so strong but maintained his laid back ways, to have done his job to such a good standard, to have still been a good friend and to have remained a wonderful, adored father to Filly, to have taken care of me and for 5 days each week pretty much lived on his own; he really is a remarkable man.